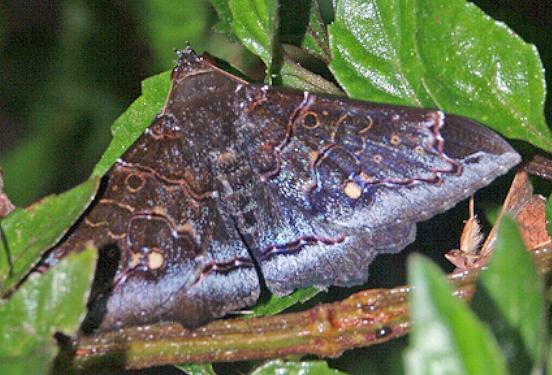 The adult moth of this species is dark brown with a mauve tinge, and has a number of thin pale curving lines across the wings. There is a dark patch at the wingtip, and a round white spot near the tornus of each forewing. The forewing tips are curved back, and the hindwing margins each have a double recurve. The wingspan is about 6 cms. LeapFrogOz, Kuranda, 2015, p. 149. Volume 32 (1908), p. 64.